Fifty years ago, Clinique launched the first-ever line of dermatologist-developed, allergy tested, 100% fragrance free skin care. Clinique’s rigorous testing protocols were an innovation in the world of beauty. Over the years, as ingredient research evolved, so did the products. 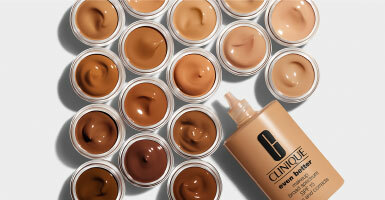 Clinique has removed parabens and phthalates without compromising the efficacy of their formulas. The company avoids using allergens, irritants and ingredients in ways that could potentially harm skin. All products are thoroughly vetted through a full suite of tests to help ensure your skin’s safety. That’s why you can trust Clinique to help keep your skin happy. Creating happy, healthy skin has been Clinique’s mission from the moment it was founded in 1968 by a savvy beauty editor. She worked with a leading dermatologist to develop a safe, effective routine for skin, and Clinique’s famous 3-Step Skin Care System was born. With three simple steps twice a day—cleanse, exfoliate, moisturize—anyone can create great skin. Clinique has continued to create the safest, most effective formulas, focusing on simple routines that bring remarkable results. 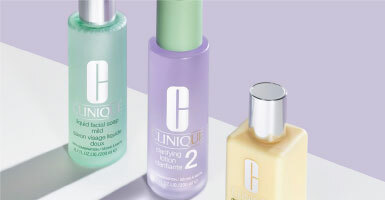 Everything Clinique is formulated for maximum results without irritation. Express yourself with Clinique makeup. Mistake-proof formulas are kind to skin and so easy to wear. Clinique foundations are like a second skin. Look perfectly natural with shades for all skin types and tones—best-selling Even Better formulas offer up to 56 shades. Lip color has creative range with luscious finishes and textures, from matte to shimmer, balm to gloss. For lashes, Clinique has every effect, from beyond-belief length and volume to ingenious Bottom Lash. All ophthalmologist tested. Everything is formulated for maximum results without irritation. No parabens, no phthalates, no fragrance. Just happy skin.